In the beginning, Makigami declared that this time he might sing less than usual. That means this will be night of jam and improvisation. However, most of the audience anticipated that. Because the place, Airegin in Yokohama, is jazz club famous for its policy. Specialized in real jazz and improvised music, the venue has been around for over 20 years. The band choosed the place and that means something special, unusual thing would happen. The band went to the stage and while Makigami did preamble, all of sudden Shimizu battered a mouthpiece of his bass clarinet with his fingers and made a series of crackling sounds. It was a signal of starting to play and the band did a long improvisation. It continued over 20 minutes. Fierce, strong performance with various drum beats. Next they did an instant composition. Mita showed some motif and the band developed New Orlean-ish, Allen Toussaints-like song from it. Makigami also made up a lyrics and sing it. After that, the band went back into long improvisation. Then Sakaide teased with the opening phrase of "Beto Beto" on his bass and the members quickly reacted. It became extended performance than usual, 15 minutes long, including Makigami's cornet solo. The 1st set ended with it. It seemed to me that most of the attendees was regulars and expected something different that night. But of course there was exceptions. In front of the stage, there was a little girl escorted by her parents. Makigami did notice and chatted with them in the intermission. Dad told him that his daughter's favorite tune was "At the End of the 20th Century" and Makigami replied they'll do the song later. At that point, the band did only one composition ("Beto Beto") and that was probably out of the expectation for them. The 2nd set started with long improvisation, too. After that, Mita talked about one of his old composition, entitled "The Morning too chilling". He said it was still in progress and showed the main riff. Having been explained the chord progression, rhythm pattern and some embellishments, the band picked them and worked together on stage. It was curious experience. I felt like witnessing their rehearsal. The band grasped it quickly and started playing. Makigami was watching Mita hummed the melody, then suddenly shouted "I got it! It's Rokyoku!" and started singing exaggerated Rokyoku-like phrases. Rokyoku is a genre of the traditional Japanese narrative singing, used to be popular in 1920-30s but now kinda obsolete. The audience cheered. Hitofushi Taro - Rokyoku Komoriuta (Rokyoku The Lullaby) in 1990. Big hit of 1963, sold over two million and still sells 20,000 copies a year. After another improvised piece, the band launched "Sun Ra is the Pianist". It also became extended performance. In its introduction, Makigami took long cornet solo again. In outro, the band chanted the main melody, and started to march among the audience. I was quite surprised because I saw them doing thing like that for the first time. It's more like Sun Ra! Everybody in the audience was clapping their hands with the tune and I thought it's nice way to closing the set. But it was not. They went back to the stage and did "At the End of the 20th Century". Makigami fulfilled the promise with the family, and that's how the main set ended. At encore, Makigami asked the audience some request first. Someone replied "Nioi" from "Uwasa No Jinrui", and other cited "Chinatown in San Francisco" from Makigami's first solo, "Minzoku No Saiten". After showing excerpts of those songs, the band played "Mottainai Hanashi" from the "Hanauta Hajime" album. After the performance, the family looked quite happy. They chatted with Makigami again and thanked him. Hikashu has been always eager to play improvisation in concert but usually they devoted themselves to do that between compositions and certainly do not do that long. So it's very rare case. Their improvisation has some "quality", which I cannot explain properly, but I can clearly say I like it very much. They always give us something interesting and I confirmed it that night again. Hopefully they'll do small gigs again in future. Encore set on April 24, 2010 at Airgin in Yokohama. Shooted by the club's owner, Mr. Umemoto. Note at 4:59, Shimizu, the pianist, went back into the verse of "Mottainai Hanashi" from the bridge at unusual timing on purpose. The other members showed some surprise but kept in time. Big news. 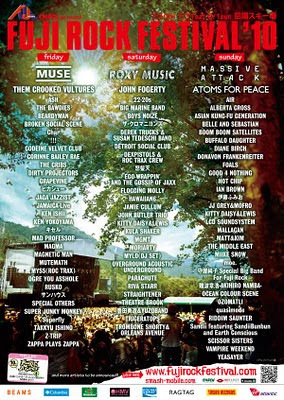 Hikashu will perform at Fuji Rock Festival on July 30th, 2010. They rarely do huge-outdoor-rock festival thing and Fuji Rock is now the biggest and the most popular rock event in Japan. Other than Hikashu, many acts of interest also appear. The festival also welcomes people from overseas. English services are available everywhere and lots of concert-goer from outside Japan come and see this thing. If you ever consider coming to Japan and attending Hikashu concert, think seriously of this opportunity. It is a rare chance to see the band performing in such a situation. The festival will be held for 3 days. And, other than music, there are lots of entertainment options you can surely enjoy. The official web site of Fuji Rock is here (in English). Lots of information is available there, including how to buy ticket from overseas. Happy travelling! Hikashu at NHK, January 1980. This is one of the earliest TV appearance of Hikashu. The program is "600 Kochira Jouhoubu" (6:00 Here is the information bureau), produced by NHK, Japanese equivalent to BBC in UK. It was news and entertainment television program, broadcasted live in 18:00-18:30 Monday to Friday, for elementary and junior-high students. It was one of the most popular program for children at that time, although its contents were occasionally very challenging. For example, regarding musicians, Gary Numan appeared and interviewed once on the program (probably most of the audience was wondering who he was). Hikashu appeared on the program on January 1980. The theme of the episode was "What is techno?" After short introduction, P-Model, Hikashu and Plastics performed live in studio. The following clips were more complete, contain all the bands performance from the episode. After the bands performance, at 8:30, Kamiya Akiro, a composer and synthesizer player, tried to explain "techno pop". The first subtitle said "Techno - how it sounds like?" Kamiya explained "techno pop music" then the bands played excerpt of their song. Plastics showed some of the instruments; sequencer, rhythm box and synthesizer. Then P-Model showed "the rhythm of techno pop". At 3:30, Hikashu appeared. They were used as an example of "the lyrics element of techno pop." Kamiya honestly said "regarding Hikashu, I cannot properly explain their words." then the band played briefly "Nazeka Burning" from (still not released) their first album. Note that Tobe Satoshi played rhythm guitar instead of alto saxophone. At 4:20, asked about the meaning of the band's name, Makigami said it was a coined word, sort of a spur-of-the-moment phrase when being surprised. Of course, it was joke. In outro, starts at 6:30, some players from the three bands played together the ending theme of the program with "techno arrangement". Also, along with Chika and Tachibana Hajime from Plastics, Makigami danced with Pom-pon in his hands. In fact, Hikashu and Plastics were close at that time and they did some tours together. The program was on-aired from 1978 to 1983. And the techno episode was one of the most audacious, now legendary one. Imagine 12 years olds throughout the nation were exposed to such a thing. It must have had a big impact on them, comparable to the Devo appearance on Saturday Night Live in 1978. They were so futuristic, otherworldly, and great. It is one of the oldest, and probably the most known, publicity photo of Hikashu. From left to right, Mitama and Tobe in the first row. Inoue, Yamashita and Makigami in the second. It was shot in late 1978, by a photographer and an old friend of the group, Takimoto Junsuke. In it, all the members were in pajama, and sat around a Kotatsu (commonly-used heater in Japan) which was placed along the roadside. The location was near a crossing, and you could see there was a taxi passing by right behind them in the background. 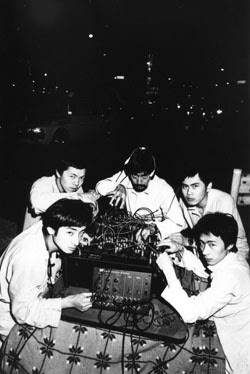 The instrument on the Kotatsu was Inoue's synthesizer, Roland System 100. The flyer of the event. The name Hikashu was already credited for music. In summer 1978, Makigami Koichi was preparing a material for the underground theatrical performance called "Yochu No Kiki," which he was to produce and write a script. In it, he intended to sing some original songs with live ensemble, and asked his friend and a composer for underground theatre, Yamashita Yasushi, for making the music. Yamashita agreed. For composing music, Yamashita asked Makigami lyrics or words to get inspired. So Makigami wrote some. One of them was titled "Yochu No Kiki". It was very short, only four lines. Another was "Puyo Puyo". After being supplied the words, Yamashita quickly wrote music for them. Looking at the lyrics now, I cannot tell what it is. They are so obscure, very puzzling and highly strange. And Makigami did not explain the meaning. So we have to use our imagination for deciphering what they meant. What do you think with those words? "Hey look, I am very sick"
"Hey look, I am so non-orgasmic"
"Hey look, I am such a fool"
"Hey look, I am so satisfied"
In "Yochu No Kiki", and the monologues of "Puyo Puyo", Makigami used a small boyish way of wording. In the case of the latter, it sounds like a kind of self-mocking to me. "Puyo Puyo", "Pyoko Pyoko", "Kuyo Kuyo" and "Pao Pao" are all adjective words or onomatopoeia in Japanese. It's hard to describe exactly what they are. Roughly speaking, it could be said that "Puyo Puyo" is meant something sloppy or flabby. "Pyoko Pyoko" is used for something bouncing or spurning the ground, like rabbit or a man whose one foot is in a plaster cast trying to move. "Kuyo Kuyo" is usually used for a person who is regretful or penitent. "Pao Pao" is used for describing sound of Elephant call. Some people think that the song "Puyo Puyo" is about an amorphous, slime-like creature who is sick and trying to stand up. I cannot tell it is right or wrong (probably), but an interesting interpretation, I think. You might notice those tunes have an out of the ordinary song structure. That is because they are written for theatrical performance. The performance was held on July 15-16, 1978 at Ekoda, Tokyo. Unexpectedly, the members found themselves being very amused for playing those songs on stage, and decided to form a band. After spending a month for rehearsals, the band made a stage appearance for the first time, as main act, at a free-jazz joint in Kichijoji, Tokyo. It was August 29th of 1978, and the beginning of its 30+ years existence. This is said to be from one of the early rehearsals of Hikashu, playing "Yochu No Kiki". Makigami played a white, violin-shaped electric bass which he got from Yamashita.